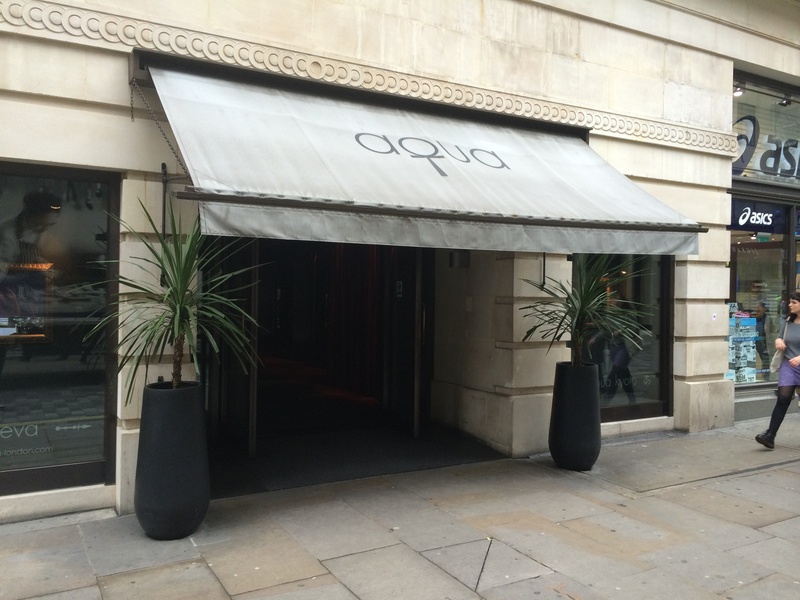 What with the hugely successful openings of Aqua Shard and Hutong in the Shard building it’s easy to forget that Aqua also have two existing restaurants on the fifth floor of the former Dickins and Jones department store opposite the Palladium theatre. 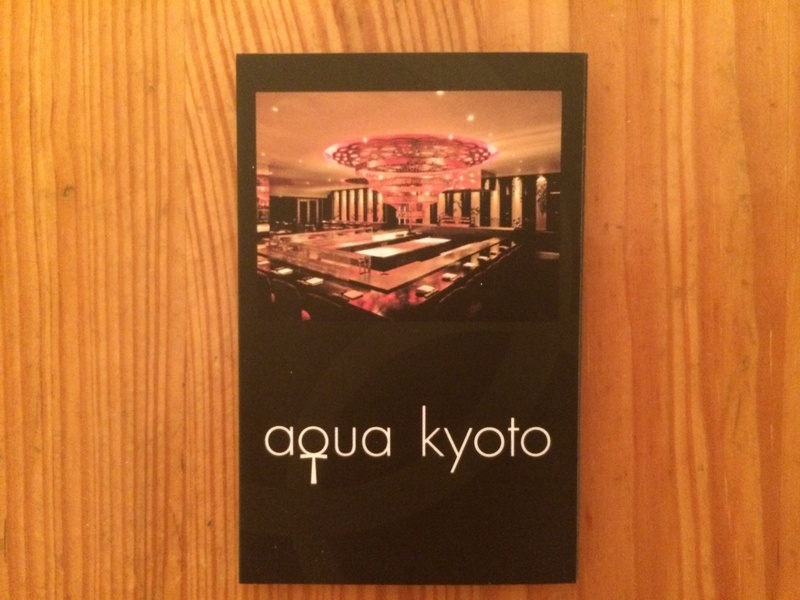 There’s Aqua Nueva, a contemporary Spanish restaurant and Aqua Kyoto, which offers Japanese fare. The latter has recently acquired a new head chef and I was kindly invited along to try some of the new dishes on offer. 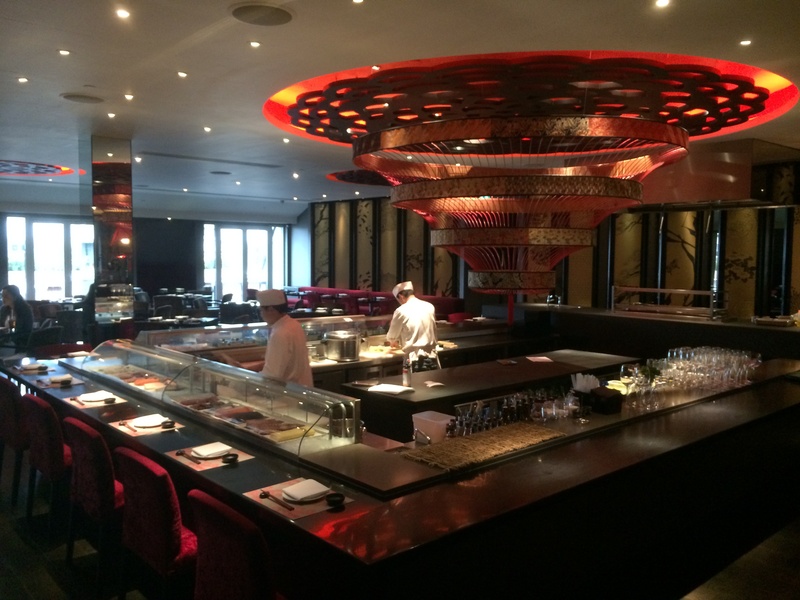 It was a large and attractive dining room with an interesting circular feature that looked like a space ship hanging over a sushi counter, complete with sumibi-yaki grill by the entrance. There was also a large terrace overlooking Regent Street below; I once spent New Years Eve here and had a great time watching the fireworks from it. Our first course was grilled asparagus with unagi sauce and sesame seeds which was cut into chunks and served on skewers. The texture of the asparagus was perfect with just the right amount of bite. The glaze that coated it was sweet and totally moreish. The next course was a real stunner; datterini tomato salad with edamame beans. It was really fresh and zingy. 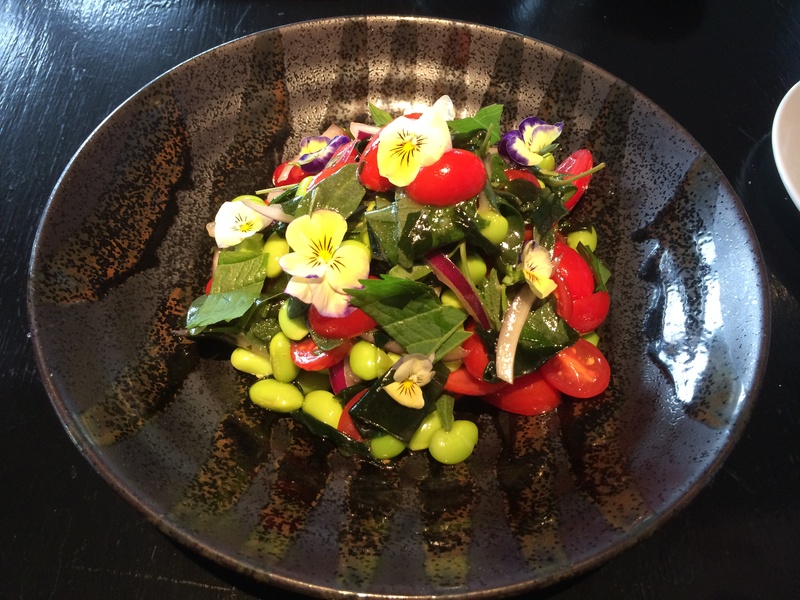 The tomatoes were sweet whilst the edible flowers were slightly bitter and the edamame beans provided texture. 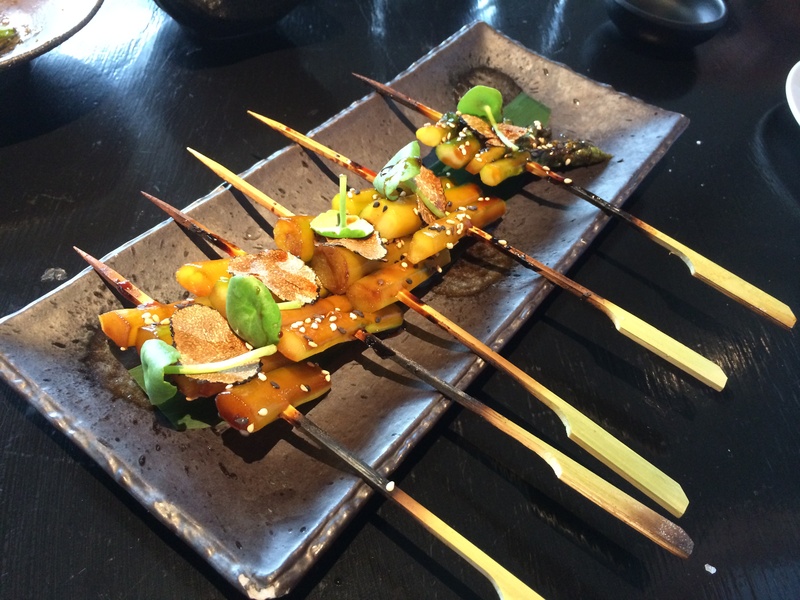 It wasn’t the easiest thing to eat with chopsticks but it was well worth the effort! Next was the chilli yuzu lamb with Japanese artichokes. I’d seen the artichokes before at L’Enclume in Cumbria and again they reminded me of little witchetty grubs – very tasty though! 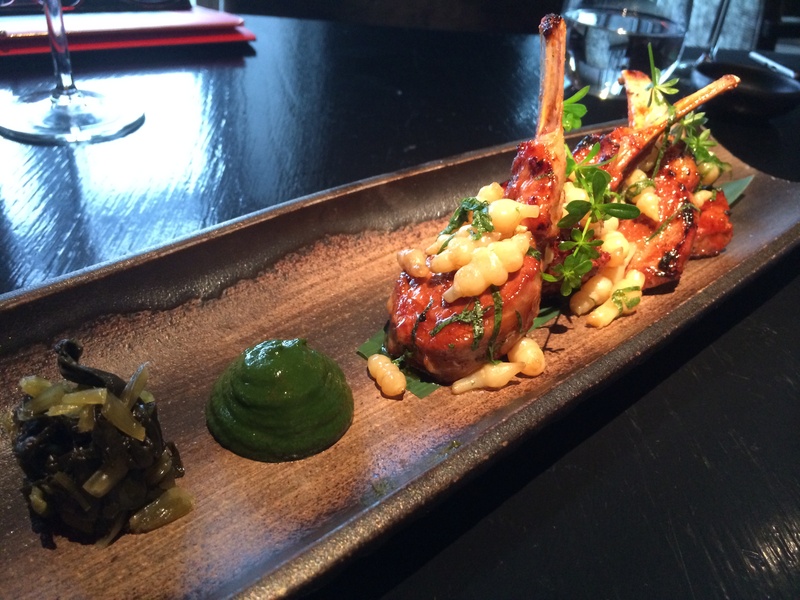 The lamb was tender and pink; more than worthy of picking up with my fingers to gnaw at the bone. The following dish was a big ol’ bowl of hearty goodness; pork belly with eel, root vegetables and Jade oil. The soup had ramen qualities to it yet was far more vibrant and colourful than any ramen I’ve ever seen before. The pork was tender and its fat melted on my tongue. The eel was equally as mmmm inducing with its salty flesh and fatty skin. Totally and utterly delicious. We finished the main courses with some sushi; dragon rolls to be precise. 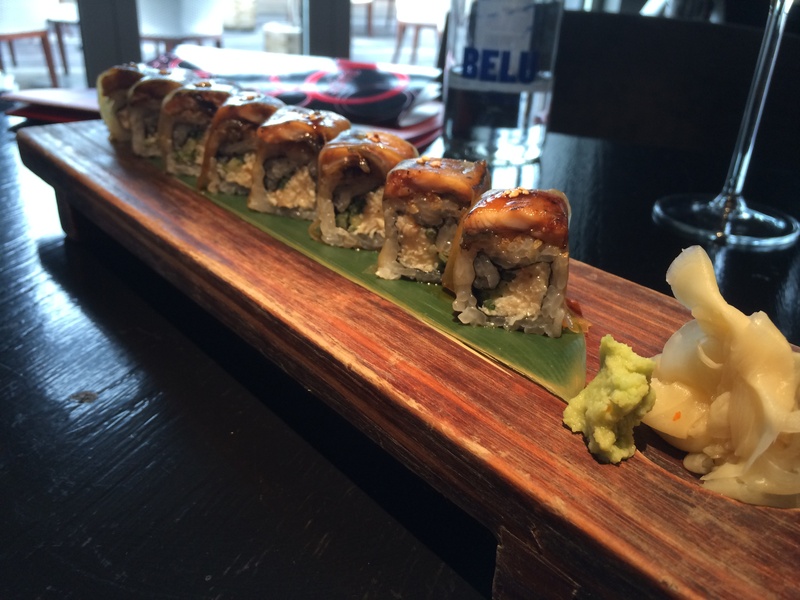 The inside of the rolls featured crab meat with saffron and cucumber whilst the top was covered in eel and seaweed. Each mouthful was sweet and salty and totally divine. Smothered with a bit of eye watering wasabi and I was a happy chappy. As I’ve found to be the case with a lot of Japanese restaurants, the desserts can often be the weakest link. Not here however. 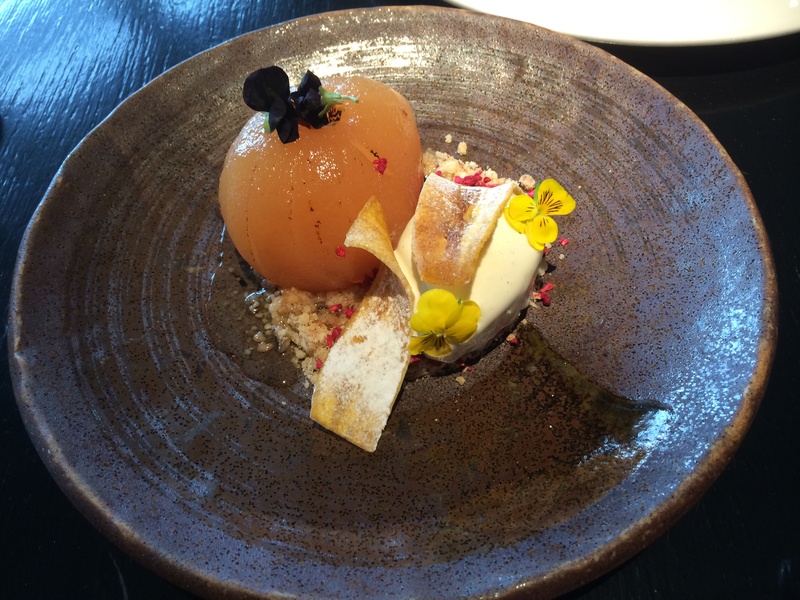 The poached nashi pear with chestnut crumble not only looked lovely but tasted it too; a totally sweet treat. It was like a posh pear crumble. The ‘Forest Floor’ dessert was my favourite however as it was even more beautiful. 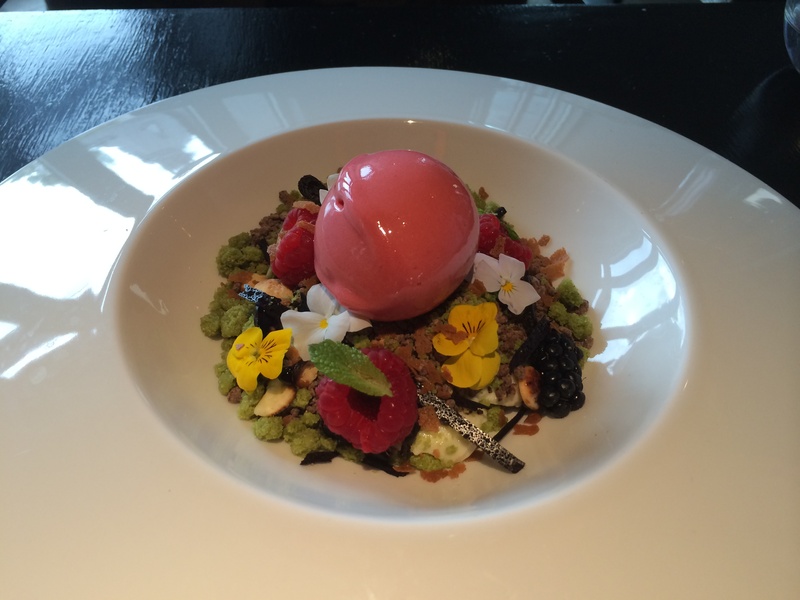 It featured a mint panna cotta with raspberry sorbet and chocolate crumble; the blend of textures and flavours was simply superb. 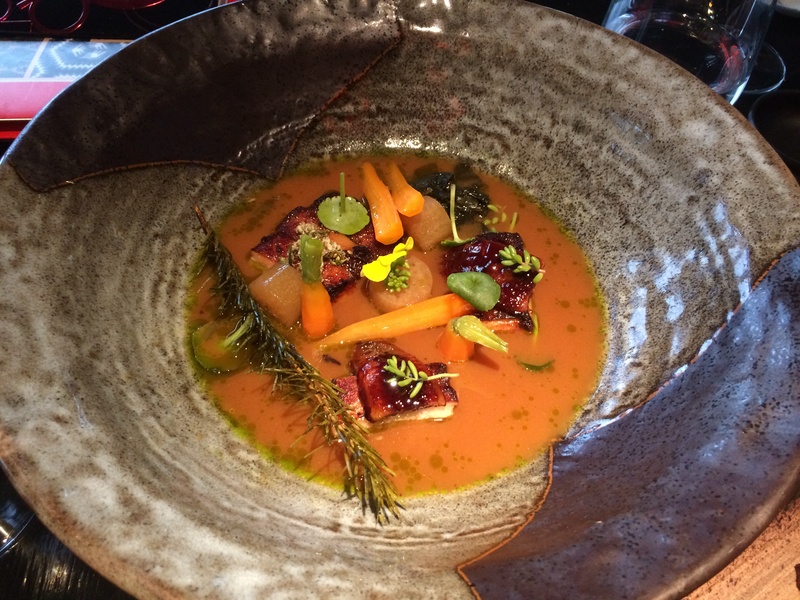 With new chef Paul Greening at the helm, the kitchen at Aqua Kyoto can only go from strength to strength. The food I tasted was seriously impressive. It’s not the cheapest place you’ll ever come across but the addition of their new two course express lunch menu (£19.95) means you could make your visit a very affordable one. That was some seriously lovely food.